Learn more about former staff members. Bernadette J. Brooten, director of the Feminist Sexual Ethics Project, is Robert and Myra Kraft and Jacob Hiatt Professor of Christian Studies and Professor of Women’s and Gender Studies, of Classical Studies, and of Religious Studies at Brandeis University and a former MacArthur Fellow. She has also held fellowships from the Harvard Law School, the Fulbright Foundation, the National Endowment for the Humanities and many other granting agencies. Brooten is currently writing a book on early Christian women who were enslaved or who were slave-holders, and she is editing a volume on slavery’s long shadow over the lives of girls and women that will focus on the intersection of slavery, religion, women, and sexuality. She has edited Beyond Slavery: Overcoming Its Religious and Sexual Legacies, with the editorial assistance of Jacqueline L. Hazelton (New York: Palgrave Macmillan, 2010). 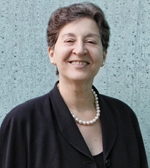 She has written Women Leaders in The Ancient Synagogue: Inscriptional Evidence and Background Issues (Chico, CA: Scholars Press, 1982) and Love Between Women: Early Christian Responses to Female Homoeroticism (Chicago: University of Chicago Press, 1996), for which she received three awards. In addition, she has published articles on Paul and the Jewish Law, Jewish epigraphy, papyrological and literary evidence for Jewish women's power to initiate divorce in antiquity, and on various topics of ancient Jewish and early Christian women's history. Brooten studied German at the University of Portland (B.A. 1971), Roman Catholic and Protestant theology at the University of Tübingen; Talmud and Jewish history at Hebrew University and the University of Tübingen; and New Testament, ancient post-Biblical Judaism, and early Christian literature at Harvard University (Ph.D. 1982). She previously taught at the School of Theology at Claremont, the Claremont Graduate School, the University of Tübingen, Harvard Divinity School and the Department of Theology of the University of Oslo in Norway.